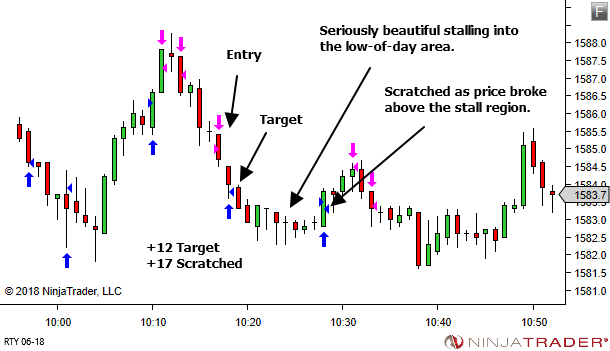 By far the majority of my trading decisions are based upon TTF setup areas and LTF pattern-based execution (or scalper-channel execution). 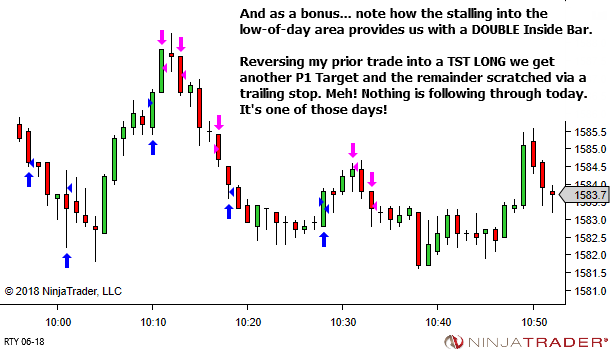 Very rarely do I enter based upon the TTF price action alone, without any real reference to the lower timeframe chart. When I do though, it's almost always due to the presence of a narrow-range Inside Bar. The concept is simple – volatility contraction leads to volatility expansion. 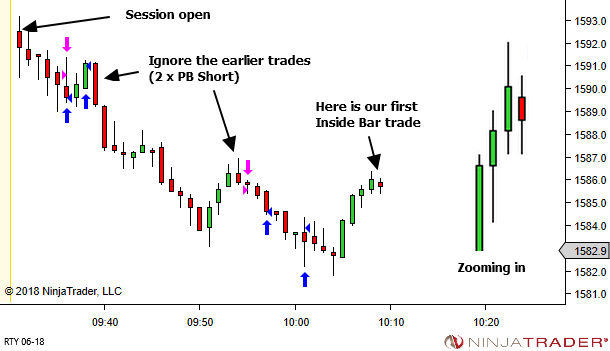 And yes, an inside bar is an example of volatility contraction. It's simply occurring over a very short time scale. 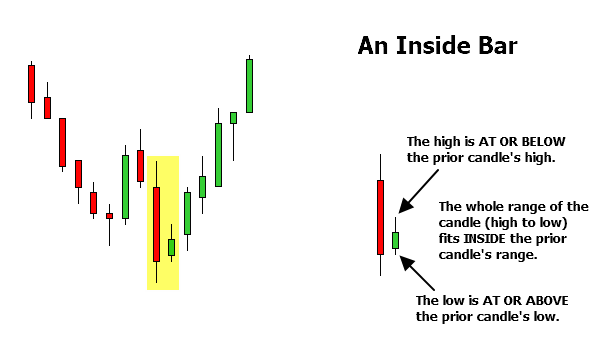 Look to the context of the market and decide – avoid it, take a breakout long, breakout short, or bracket it for either direction. You can't just trade them all. If they appear in the middle of any extended sideways chop, then just stand aside. And you've always got to watch for a fake-out, where they break one direction and then immediately turn to move out the other side. Where I like them best is in a smooth-flowing market, at the end of a price swing. 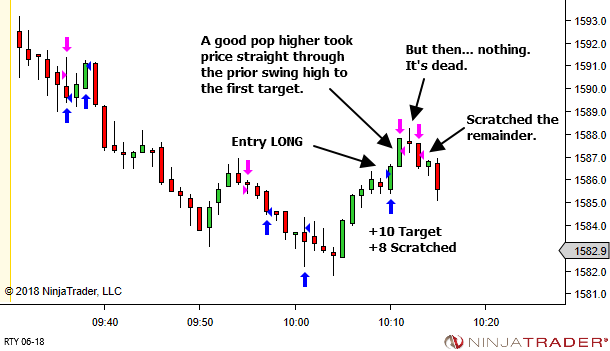 They can often provide a simple trigger to enter into the next price swing. And more importantly – good Reward:Risk potential. The market is flowing nicely. YTC PAT traders – note the weakening trend via reducing projection just after 10:00 (two occurrences both with nice lower-tail rejection). Note also the strength of the price swing off the lows. For these reasons, the Second Principle applies and I'm not interested in SHORT here. I'll wait for a complex correction. 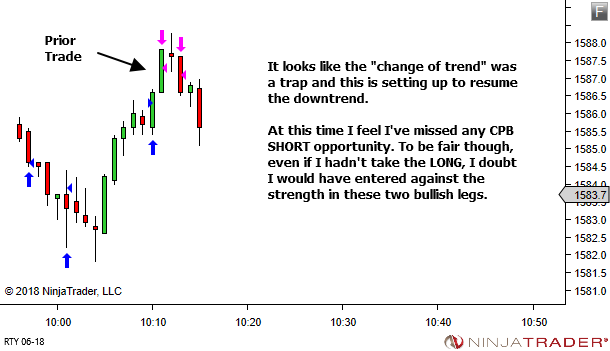 Normally, this wouldn't imply entry LONG. However, the inside bar has tempted me. Given it's nature (volatility contraction leads to volatility expansion) any push higher will not only provide the second swing that is needed for my complex pullback, but also potentially break the prior swing high (and the trend definition as well). It could get quite a nice pop higher. From a setup name perspective, it's pretty far from being a textbook perfect example. But it is a very shallow (single bar) pullback LONG pre-empting a change of trend. Yeah, not something we would take every day. But in a smooth flowing market, with strength off the lows and expectation for a second leg higher, with potential to break the trend change point, let's give it a go. As always, context is essential. And the market "should" be flowing nicely. 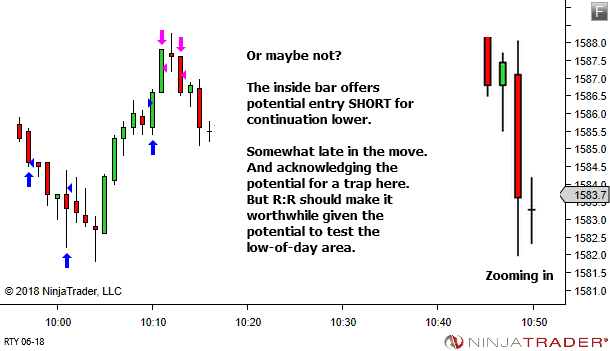 Given these conditions, if you get a TTF narrow-range Inside Bar in the right area, consider whether any short-term volatility expansion might offer trade potential.